Today’s emergency services are almost voice-only capable and only a marginal share of data and multimedia is used by Public Safety Answering Points (PSAPs). Improving access to emergency services for deaf and hard of hearing citizens induces enabling PSAPs and people in need to handle their modes of communications such as text. 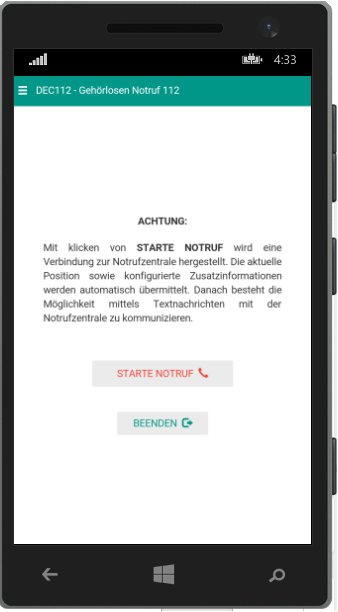 Today there is such a text based service available in Austria. Only the implementation is deficient. People in need must send either a FAX or SMS message to 0800 133 133. There are no detailed figures describing how often this service is used in Austria and how successful it is, but affected People repeatedly reported issues with the service provided. Even worse, there is the case of an Austrian MP who burnt down its kitchen because of not being able to contact the fire brigades in time. 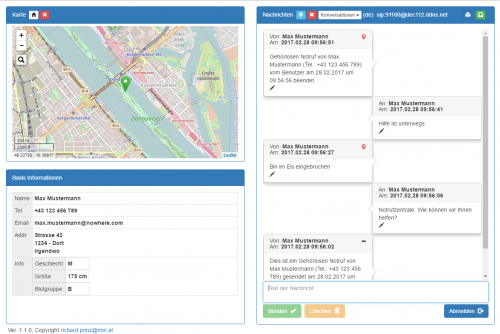 Currently things like text to emergency services and location based emergency call routing is not available in Austria. But technical standards are already available so it is just a matter of doing it. This happened 2015 when some colleagues of mine (W. Kampichler) at Frequentis and I started a private initiative with the aim of providing a better, more modern way to support deaf and hard of hearing people when making emergency calls. At a first glance it sounds like an easy job but, considering the challenging parts with Austrian emergency services like a bunch of different emergency numbers and the fact that emergency services are the responsibility of federal states, it gets though. In technical terms it means different services (at least for fire, ambulance and police) and service regions based on Austrian federal states combined with functional elements of an NG112 architecture. An early prototype was demonstrated to various emergency organizations, the deaf and hearing impaired community (WITAF, ÖGLB), Austrian MPs and members of the cabinet of BMVIT. We were able to launch a first version of DEC112 on February, 11th, 2017 (the 1-1-2 day). 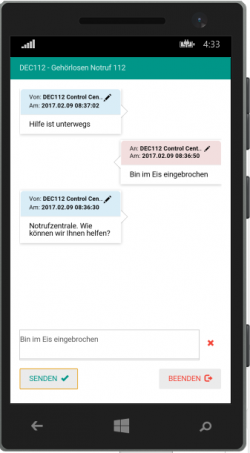 This version is not intended for emergency calls but shall help to evaluate how such a service integrates with PSAPs in Austria and if deaf people are happy to use it. DEC112 provides an easy, reliable and secure way for deaf or hearing impaired people to text for help in an emergency through a simple and intuitive interface. Using state of the art technologies and standards goals and features like a single mobile application for all major platforms (Android, Apple IOS, Windows [Desktop & Mobile 8.x / 10]) or location based call routing utilizing NG112 core services [e.g. LOST] were achieved. Figure 1 shows the PSAP web application. The call taker gets all important information at a glance and multiple conversation can be handled in parallel. Text to speech is used to draw the attention of an operator to incoming emergency calls. After an operator accepts/confirms a new conversation an acknowledge message is automatically sent to the user. The mobile app (Figure 2) tries to be as minimalistic as possible to not distract a stressed user during an emergency and helps to save valuable time with predefined personal information and the current location sent automatically to the PSAP. In the case when no messages are exchanged (e.g. a person becomes unconscious) the position is continuously sent as long a data connection exists. When a user explicitly ends a conversation an additional message is sent. This way the control center can distinguish intentional termination from connection loss. The following demo video of DEC112 shows the mobile app (Apple IOS Version) on left side of the screen and the control center web application on the right side. It shows the process of an emergency call. We hope to receive a lot of positive feedback from our current testing partners like RTR Austria, NOTRUF NÖ, WITAF, LWZ OÖ or Leitstelle Tirol and perhaps continue with a funded nationwide trial of DEC112 later this year. DEC112 is a private initiative and benefits from volunteer activities to implement the next steps. In this context, we particularly thank Frequentis for sponsoring the Infrastructure and Mario Murrent for his Apple iOS support.